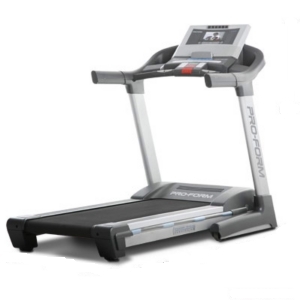 The ProForm Perspective ES treadmill is a TV and entertainment model that takes the boredom out of everyday workouts. In addition to allowing you to watch your favorite shows, the ProForm Perspective ES has an MP3 plug-in port and a built-in sound system. Its 28 workouts are extensive and you can choose between aerobic, weight-loss or performance goals programs. UPDATE: The ProForm Perspective ES has been discontinued and replaced with the all new upgraded PRO Series models. To find a comparable treadmill check out the new full lineup from ProForm to see which model appeals to you. The ProForm Perspective ES treadmill is a solid little TV treadmill for its price. ProForms have been knocked about in the industry for their weak motors and warranties and poor quality, so it’s a mystery why ProForm has sprung this excellent little model on us! Under the hood is a mid-size 3HP motor, one of the largest motors you’ll see on a treadmill at this price. What’s not to love about the ProForm Perspective ES? The one year parts and labor warranty is too short but you can buy an extended warranty at the time of your purchase. Any MP3 player will work when plugged in to the treadmill console and the premium sound system combines high-end speaker and subwoofer components. Users of the ProForm Perspective ES also love the vivid TV picture, or when the TV is turned off the screen shows your workout progress in multi-color. The treadmill’s workout programs will keep you sweating, and the rest of the features - wide deck, absorbing cushioning on each stride, one touch speed changes - are usually found only on higher priced models. 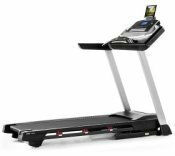 We normally expect to have reservations about any treadmill with the ProForm name on it but were pleasantly surprised to find their TV model offers so many eye-popping features and upgraded components. We don’t normally endorse TV treadmills at all since homeowners can easily afford a small TV for the home exercise room, but the ProForm Perspective ES treadmill deserves a second look. It’s a decent machine at an attractive price when it can be found for under $1500.